“The best four days in gaming” they call it and I cannot disagree. 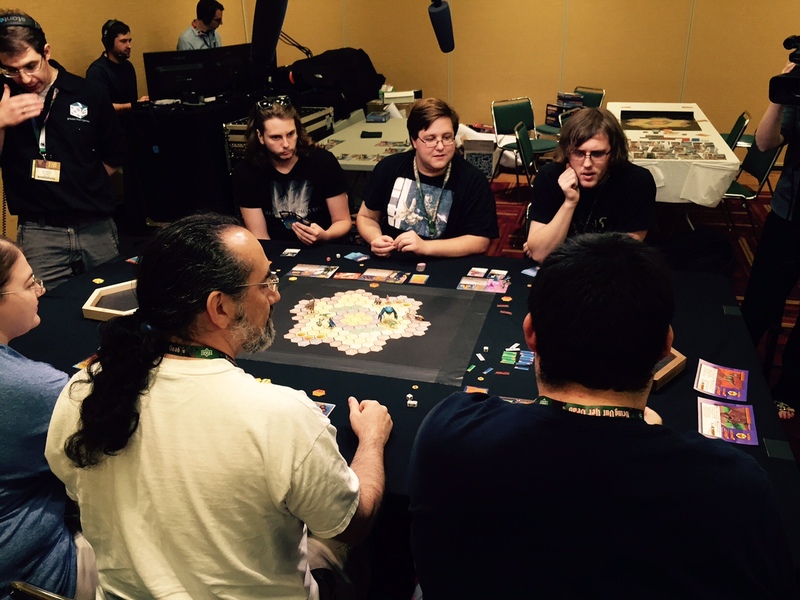 GenCon 2015 was last weekend. It’s a great opportunity to get broad data on the whole of the industry, to see the direction each company is taking, to see some old friends, and to make new ones. Through the experience, we featured three games and saw a number of other interesting ones. Here are some of the highlights from Indianapolis. The Sentinel Tactics tournament, going strong. 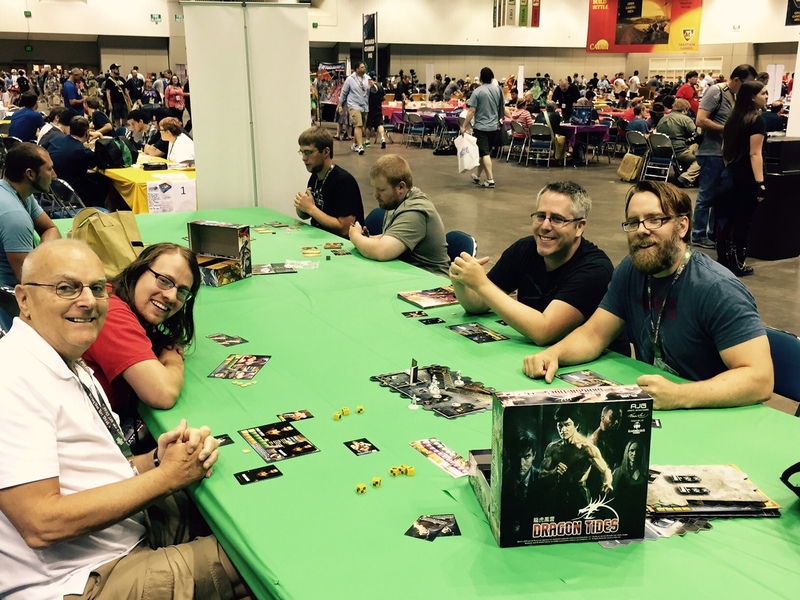 There’s an annual horror story at Gen Con–the critical game that arrived late or not at all. APE Games was the recipient of this dubious distinction last year when the entirety of their booth waited until opening day to arrive. Luther and I were immeasurably relieved to see that we were not this year’s candidate. Our printers proofs of Dragon Tides arrived and we could finally share it with the world. Whole the Sentinel Tactics tournament progressed, a steady stream of players was experiencing Dragon Tides for the first time. Immeasurable gratitude must be given to these fine folks for taking DT out for a spin. It was a blast taking them on, even if they did mow through my minions like the veritable thresher through wheat. The second expansion for Rolling Freight will be coming soon. Gen Con’s Puffing Billy tournament created the perfect opportunity to share these maps with rail enthusiasts. For you designers out there, Expansion #2 is a good example of listening to public demand. We saw a large number of requests on the message boards for two-player maps and for faster-playing maps. These maps–one for Mexico, one for the Austro-Hungarian empire–were created specifically to respond to these demands. Gil Hova’s came down with a major mental affliction last year when he announced his intention to self publish. It was then that Formal Ferret Games was born. With all teasing aside, Gil has already revealed some remarkable designs. Gil was tireless at Gen Con, dashing here to show his solid eurogame Battle Merchants from Minion Games, scampering there to preview his new pharmaceutical pitch game Bad Medicine, and clambering over there to preview his television programming game The Networks. I’ve played them all and am humbled to see how good each one is. Gil Hova teaches Battle Merchants to a rapt audience. The core set of Quartermaster General was one of my final purchases at Gen Con last year. We liked it so much that their Air Marshal expansion pack was one of my first. If you enjoy card-driven wargames, definitely give it a try. Jay Cormier and Sen-Foong Lim are neat-o guys so it follows that they would create a neat-o party game. Put simply, players have to make pitches for products in the late night infomercial vein. 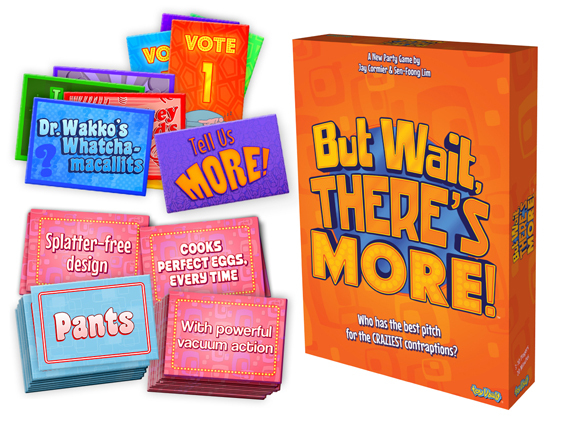 Each product must include special features in their pitch–the eponymous “but wait, there’s more” of the game. My group enjoys this kind of game quite a bit, having already tried Ewen Cluney’s anime-TV pitch game Channel A and eagerly anticipating Gil Hova’s pharmaceutical pitch game Bad Medicine. I’m expecting this one to be a big hit at our table. Having played this gem only a few weeks ago, it went directly onto my MUST BUY list. You can check out my overview of the game here. As yet, Codenames still stands as this year’s pick for best game to play with nongamers. I hadn’t seen its Kickstarter but the a group playing Norsaga in the boardgaming hall caught my eye and when that game wrapped, designer Kevin Bishop kindly gave me a walk through. At its heart, Norsaga is a game of building your family tree. At a glance, Norsaga is reminiscent of Familienbande by Leo Colvini. However, I found Bishop’s approach clean and engaging. I plan to pick up a copy sometime soon and take it out for a full play. This game was only loosely on my radar but I did get to play a brief overview. Vangelis Bagiartakis game is at its heart a combination of Dominion with Kingsburg. Some players compared it to Machi Koro but I found its decisions to be significantly more interesting. The booth demo only allowed for a few short turns but that was enough to convince me that Dice City deserves a try when it comes out in October. 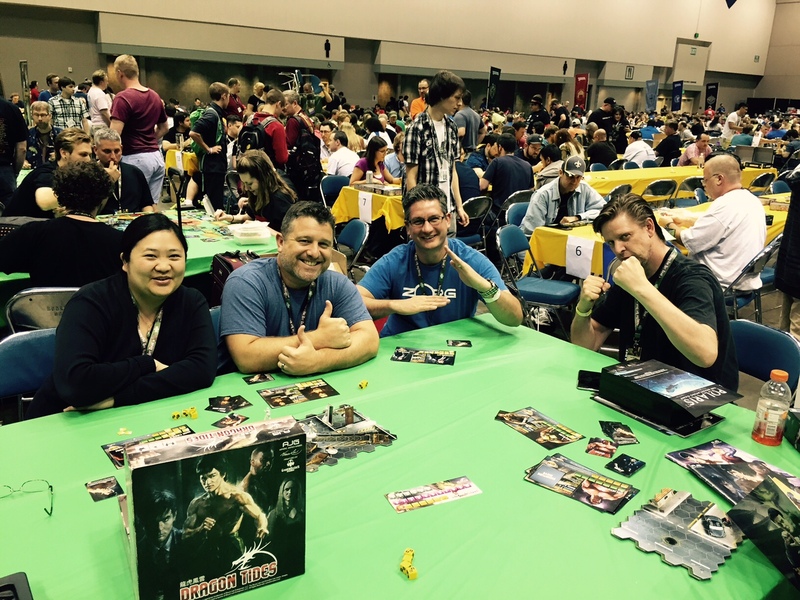 Those were my highlights of Gen Con 2015. How about you? 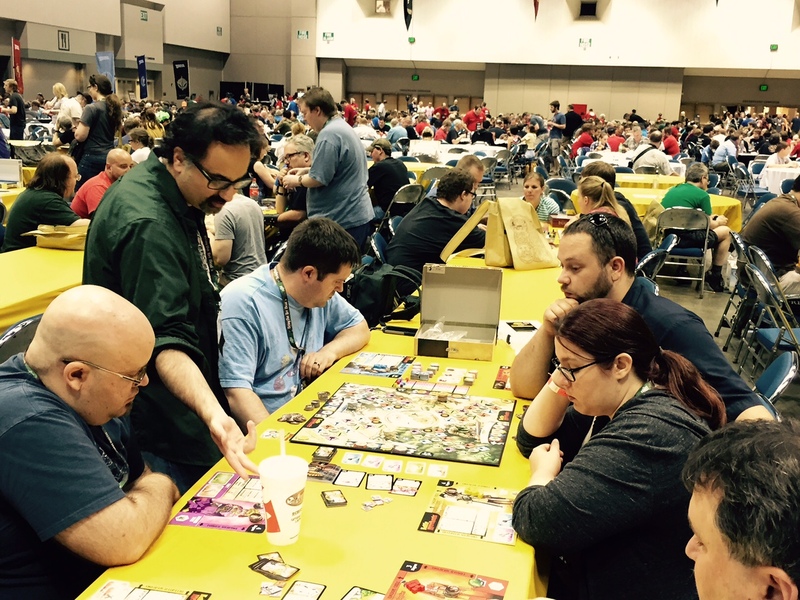 Were you at Gen Con this year? What stood out for you? Share with your fellow readers in the comments below. And if you’re enjoying what you’re reading, create an account with WordPress and follow this blog. If you keep reading, I’ll keep writing. Luther Bell Hendricks V and I just completed development on the Dragon Tides core game set. Now we’re sharing the experience with you. We knew immediately that we wanted Dragon Tides to promote the image of its stars, to have characters at multiple levels, a campaign mode, and action movie flavor. With these objectives in place, we developed a core engine that would support them. With our core engine in place, we set to differentiating the characters through their Stats up and through their Signature Moves. But what are action heroes without movies to star them? We thought Dragon Tides would benefit from a campaign mode. Since all our characters came from action movies, the clear approach was to structure the campaigns to look like the source material. Some say that a story is only as good as its villain. We cast one player as the Master Villain–an active player who was playing to win. This player was sure to be even more devious than any AI our team could ever dream up. All the other players in the game are cast as Dragons–the heroes of the movie. Each movie is a series of scenes. The first scene in each movie is an action sequence. If James Bond can start all of his movies in media res, why not us as well? I had fond memories of the Choose Your Own Adventure books from childhood road trips and convinced Luther to let me put a similar mechanism into our game. Now the aftermath of each scene could flow into a different narrative, depending on who won or by how much. At critical moments, the game additionally gives players the choice of how to pursue a given challenge and each choice leads to a different scene. Players want to see improvement. They want to see their characters get stronger as they play. Instead of playing a static character throughout the movie, we start each character with only three of their six signature moves. At the end of each scene, rewards are given out. Characters recover from damage (have you ever seen an action movie character stay hurt for long? ), gain items, gain additional Signature Moves, or even gain Stat bonuses. Even the Villain player gets a share of the action, earning extra minions to bring to the final showdown in additional to rewards similar to those of the Dragons. Scene Rewards are a bit of a Skinner Box, of course. These rewards kept our players engaged with their characters; eager to see what rewards come next. We game designers must always be careful to use our powers for good. So you can see all the parts in action, here is our working-draft flowchart for the second movie we wrote. At the end of each scene, the story forks depending on how the scene resolved. Did our heroes best those thugs and protect the owner in the opening scene? If so, they interrogate one of these thugs and learn his next target. Did the thugs in the first scene get the best of our heroes? The Dragons can still intercept them on their way to the garden shop. And some scenes give players their choice of path. 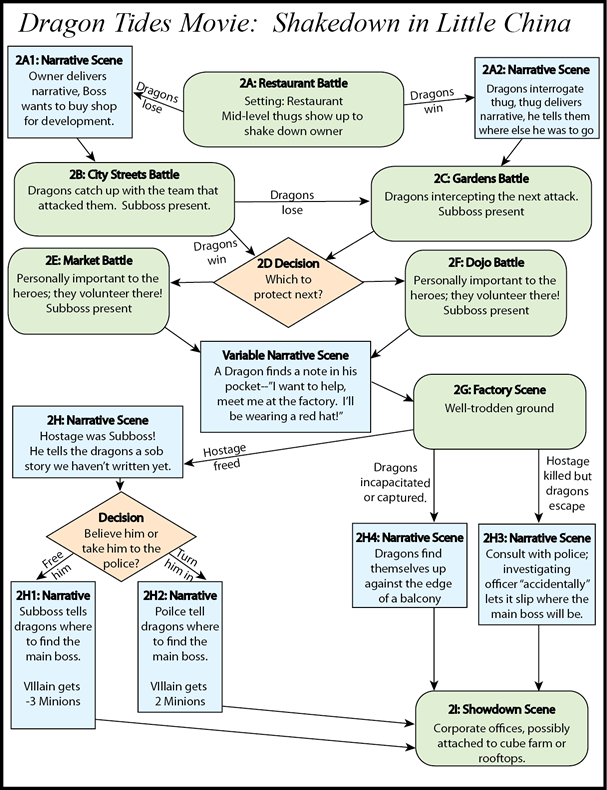 The Dragons have dealt with the threat to the neighborhood garden shop but now two targets are threatened at the same time–shall they protect the neighborhood dojo or the neighborhood market? Either way, they leave the other one relatively undefended. Notice finally that no matter which branches your narrative follows, they are always nudged toward the final showdown. Action movies needs their climax and we wanted to make yours would have one as well. Through a solid game system, a variety of characters and adventures straight out of action movies, Dragon Tides became exactly the game Luther and I wanted to create. It has been a big project. But it has also been a satisfying project, rewarding our effort with a fast and fun action game. And if you’re interested in getting a copy of Dragon Tides for your very own, Artistic Justice is accepting preorders until the first week of March. What do you think of the rewards structure in Dragon Tides? 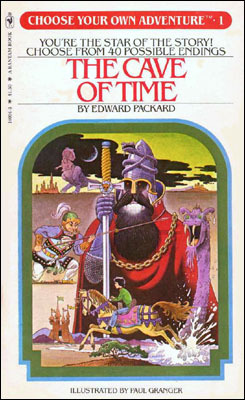 Or of its Choose Your Own Adventure model? What other games used these approaches? Which ones used them best? Why? Share with your fellow readers in the comments below. And if you’re enjoying what you’re reading, create an account with WordPress and follow this blog. If you keep reading, I’ll keep writing. Developing Dragon Tides has been incredibly satisfying. My adolescence was filled with Hong Kong martial arts movies and my twenties were filled with Hollywood action movies. Having a chance to design a game that brings these genres to your tabletop has been an honor. This is the experience of cooking for a president, of painting The Queen, of painting for the Louvre. This week marks our deadline for development of the core game set. It’s a perfect time to share the experience with you. 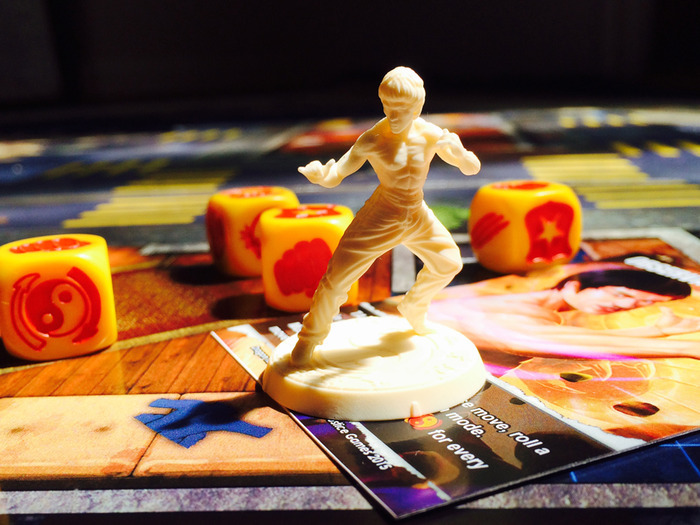 It was Alex Lim of Artistic Justice Games secured the license for Bruce Lee, Brandon Lee and several other action movie stars for Dragon Tides. AJG was partnered with Greenbrier Games to produce the game. Luther and I already were already working on a project for Greenbrier so the two asked us to be the designers. It was clear that this would be a big project but we were just coming off of Sentinel Tactics and eager to take on another project of that scope. We knew immediately that we wanted Dragon Tides to promote the image of its stars, to have characters at multiple levels, a campaign mode, and action movie flavor. Did we succeed? I believe we did. Our first task was to create the core engine. Alex already had a number of ideas about how the game might play. He also had some sample components shown below–character mats, maps, custom dice–we set to work building on his ideas. Our initial plan called for players to spend dice to make their characters take actions. To move, you would spend a die that rolled a foot symbol. To move multiple spaces, spend multiple feet. Attacks would cost fists. Defense costs shields. Spend one type of die, then play passes to the next person. The round ends when all players are out of dice. This approach offered a fair bit of strategy but was lacking in excitement. That’s no good for an action game. The second plan was an extension of the first. Dice were still spent in a similar fashion but now players spent all the dice they wished in a single go. You might then spend 3 dice showing feet to move 3 spaces, then spend 4 dice showing fists to make a strength 4 attack. Your opponent would spend shields to cancel fists on a 1-for-1 basis and take damage from any fists which remained. Better but still not exciting. Plus any player who had spent all her shields defending against an attack early in the turn was helpless against late-turn sharks. No fun for that player. Back to the drawing board. We explored a few more ideas before finding the right system for Dragon Tides. The custom dice stayed but with fewer icons: Fists and Shields only. Each character on their turn gets to first move, then act. Each character has a short list of Stats–Move governs how many spaces the character can move on its turn. Strike, Throw and Grapple represent the three ways a character can attack an opponent or interact with things in the game world. With our core engine in place, we were able to begin customizing the system to each character. Dragon Tides was on its way! Our next post will take you on a trip through the Signature Move system. Come by and see how a hand of six cards can differentiate characters. See you then! And if you’re interested in getting a copy of Dragon Tides for your very own, Artistic Justice is currently accepting preorders until the first week of March. What do you think of the core mechanism in Dragon Tides? What other games used this approach? Which ones used them best? Why? Share with your fellow readers in the comments below. And if you’re enjoying what you’re reading, create an account with WordPress and follow this blog. If you keep reading, I’ll keep writing.